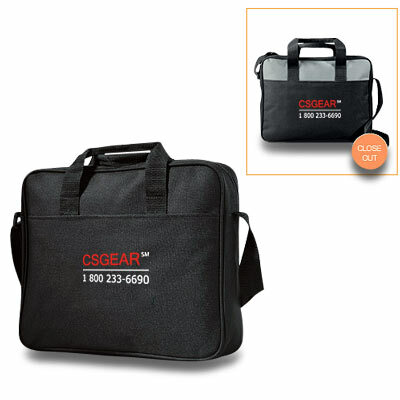 Personalize this ideal travel briefcase with your company logo. Perfect for busy professionals to keep all important documents and business accessories at hand. Zippered main compartment and spacious front pocket keep essentials organized from calculators and notepads to CDs, and this polycanvas briefcase has adjustable comfort shoulder strap, plus hand carry straps. 5 business days (estimated). Please call for rush orders. Size: 12 x 3 x 15-1/4. Prices include one color, one location imprint. Black. Numerous imprint locations and options are available; please contact us for details. Set-up charges apply. Please contact for details.